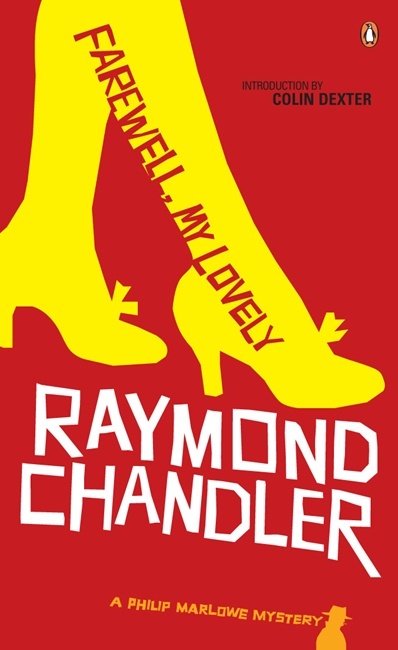 Farewell, My Lovely is the second and perhaps the best known of Chandler's Philip Marlowe books and while it wasn't a huge success when it was was first published Farewell, My Lovely is now considered to be a hard-boiled pulp classic. These books revolve around the hard-drinking loner private detective Philip Marlowe - a streetwise and sharply dressed but rather broken hero who has a vivid sense of the absurdity and harsh reality of life. His sardonic first person observations and Chandler's prose still crackle with life all these years later. Marlowe was everything that Chandler hoped and feared he might be and the author would always return to these books - even abandoning Hollywood to write more of them. Despite his status as one of the great American popular authors and his very American descriptive style, Chandler was a man of many contradictions and believe it or not was raised in England. Marlowe was actually named after Marlowe House at Dulwich College where Chandler had studied as a young man. When he returned to the United States (where he had been born), Chandler became very interested in the progression of American-English and used it as memorably as anyone in his twisty and enjoyable detective novels. His turn of phrase and the distinctive voice he gave Marlowe remains highly entertaining. "The eighty-five cent dinner tasted like a discarded mail bag and was served to me by a waiter who looked as if he would slug me for a quarter, cut my throat for six bits, and bury me at sea in a barrel of concrete for a dollar and a half, plus sales tax." The seamy underbelly of the American dream, that booze sodden gaudy low-rent plastic neon lit world of cheap bars and lonely streets was perfectly captured. Farewell, My Lovely begins with Philip Marlowe being offered a case by a hulking ex-convict named Moose Malloy who has only recently come out of prison. Malloy is not the ideal client or someone you'd go out of your way to meet or work for but Marlowe hasn't had a case for weeks and so takes the assignment. Malloy is looking for his old showgirl girlfriend Velma and Marlowe begins his investigation by trying to work out who ran the club Velma worked at in downtown Los Angeles. Marlowe draws a blank as the owner has died and his widow doesn't recall a Velma and so he returns to his office and mulls over how Malloy - who despite being almost childlike at times is incredibly strong and not adverse to violence if the mood takes him - will react. "He was a big man but not more than six feet five inches tall and not wider than a beer truck." However, another job soon lands in his lap when the foppish Marriot hires the detective to accompany him to Purissima Canyon. Marriot's girlfriend had some valuable jade jewellery stolen but the thieves have apparently agreed to return it in exchange for $8,000. Marlowe is not completely convinced by Marriot's story but money is money and he can't afford to be turning down cases at the moment. This is merely the start of what becomes an increasingly complicated series of inter-locking events as Marlowe has to recover the jewels and deal with a bizarre case involving crooked policemen, racketeers, a psychic, an asylum and - of course - the formidable Moose Malloy. One of the brilliant things about this story is the way that Chandler simultaneously makes it both outlandish but grounded at the same time. Roger Thornhill has nothing on Philip Marlowe and the sequence of events that our rough diamond hero is drawn into are preposterous when placed alongside one another but they are wonderfully dovetailed together and it somehow feels like this could really happen to a threadbare private detective who takes strange cases and isn't afraid of danger. Like the Ian Fleming books, the hero has a dark aspect to his character but also a sense of justice and duty. While James Bond is loyal to his country above all else, Marlowe is trying to make sense of the world. He is forced to confront its ugliness and wants to make it a better place. Chandler actually knew Ian Fleming - Marlowe and the literary James Bond being not a million miles apart with their detached status in life and propensity for danger, strong coffee and a lot of alcohol. Marlowe is a great character. Paranoid, self-aware, intelligent, sarcastic, boorish, independent, tough, sardonic, funny. "Randall and I took our hats off. In that neighborhood that probably ranked you with Valentino." It's no wonder that Chandler became one of the most parodied of authors. Marlowe is no saint (he wouldn't be any good as his job if he was) but he does have a sense of morality. There is an undercurrent of racial tension in the story too that is very much of the time. Use of slang (just like Fleming again) is dated and not exactly politically correct today. Chandler has been accused of retrospective racism but he wanted Marlowe to talk like a real person would in that era. With a somewhat blunt wit and disdain for sham and pettiness. I love Chandler's descriptions of the people Marlowe meets, many of whom are of course grotesque and crooked. It makes the characters come to life in vivid fashion. I like the introspective nature of Marlowe too (perfectly illustrated by the fact that he plays chess against himself). "Twenty minutes' sleep. Just a nice doze. In that time I had muffed a job and lost eight thousand dollars. Well, why not? In twenty minutes you can sink a battleship, down three or four planes, hold a double execution. You can die, get married, get fired and find a new job, have a tooth pulled, have your tonsils out. In twenty minutes you can even get up in the morning. You can get a glass of water at a night club - maybe." Farewell, My Lovely remains a very entertaining and well written book.